Today author Sandra Horning made the first of three unique appearances she has scheduled for this month. She wasn't at a bookstore or a literary festival. She wasn't at a professional conference. She was at Pumpkintown, USA in East Hampton, Connecticut. Next Sunday, she'll be at Rose's Berry Farm in South Glastonbury from 10 to 12 and at Lapsley's Orchard in Pomfret Center from 2 to 4. Her recent book, The Biggest Pumpkin, is about a big fruit. Fruit...orchards, farms, pumpkintowns...you can see the logic here, right? With traditional bookstore appearances, writers are relying on readers coming to them. Readers don't always show up. Believe me. I've been there. 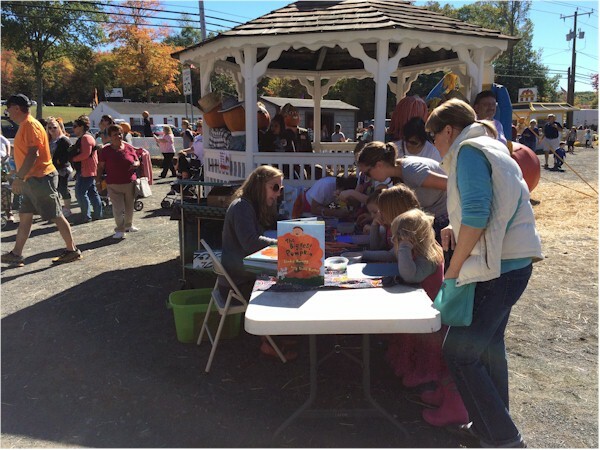 With appearances at places like Pumpkintown, however, writers are going to readers. Writers are the ones who show up. Now, one could argue that people who do turn up at traditional author events are more likely to be committed readers and more likely to buy books. However, there are a finite number of them, whereas the number of books out there seems to go on and on and on. When authors appear at an orchard, farm, or pumpkintown, they're putting themselves out in front of all kinds of people. Some of them may be committed readers, some of them may not. Some of them may be readers who just don't go to book fairs or book festivals. Some of them may have a big interest in, say, pumpkins, but haven't heard of your pumpkin book. And now they have. Authors going out to potential readers in this way gives those potential readers opportunities that they wouldn't otherwise have. At some of these nontraditional (at least for writers) events, you may see much larger crowds than you will at a bookstore. That was certainly the case today. 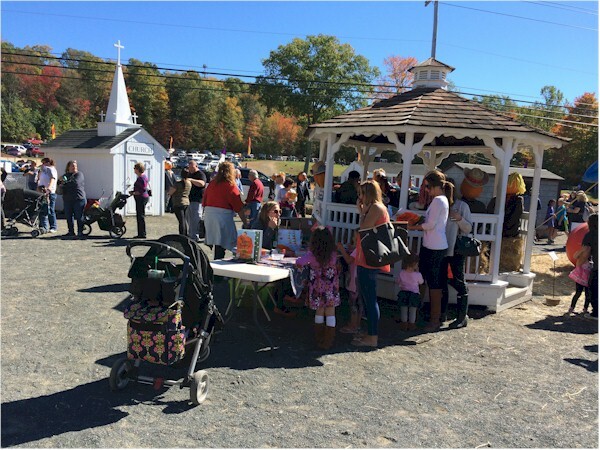 These pictures don't do justice to the number of people who were at Pumpkintown at lunchtime. In the background of the picture to the left, you can see cars parked on a hill. No, the garden center where this is held doesn't normally need the parking across the road. It doesn't normally need to hire a police officer to stop traffic for pedestrians the way it does on its six Pumpkintown weekends. The more people, the greater the potential for sales. The more people, the greater the potential for readers discovering a book, whether they buy it that day or not. But someone has to bring the book to them. 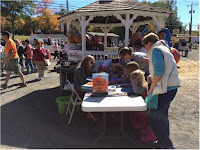 Authors Janet Lawler and Leslie Bulion have also made appearances at orchards or fairs to support books with links to those types of places. You may find authors anywhere. Fantastic idea! Great approach to get out there in front of new people. I love to read and don't attend book signings, etc., I just don't have time. But I am out with my family quite often and would certainly stop to see what an author has to offer! I suspect that's the case with many people. A couple of local writers had tables at the Grainger County (TN) Tomato Festival last year and were talking up a storm with interested festival goers. I will go to any book signing I hear about and love chancing upon authors in unexpected places. I'm glad you posted a blog about it! "chancing upon authors in unexpected places" Maybe that should become some kind of category within book marketing. That's actually a really good idea to have authors come to "non-book" places... I should see about getting an author to a metal show! Oh, sure. There must be musicians who have done memoirs or reviewers who have done books on the subject.